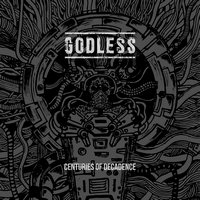 Jumping head-first into the scene two years ago with their first EP, Centuries of Decadence, India’s Godless return with their follow-up EP Swarm. Centuries of Decadence was notable for it’s aggression (and subtle melodies) and Swarm continues to move in this direction while offering some improvements and additions to their formula. Their first EP served up some old school thrash influences but it wasn’t quite at the forefront like it is on Swarm. “Infected by the Black” immediately thrusts a more thrash-infused death metal aesthetic into the listener’s view, and it fits the band quite well. The last EP was full of frantic tempos, and the thrashy portion to the band’s sound squeezes easily into the mix. Not to mention some of the nice, mid-tempo grooves that it brings to the table as well, as “From Beyond” effectively showcases. It’s still quite brutal and frenetic in design, but the thrashy elements also bring it a bit more memorability than what they just achieved with groove before. It can be intense as all get-out, but the galloping riffs play a role in making the disc retain some memorability. The vocals are still quite death metal in tone, with low growls and some occasional shouts keeping things rather monstrous. 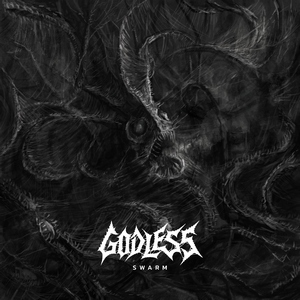 With an almost clinical level of precision, Godless come out with a scathing attack on Swarm. The EP shows how Godless has changed up their approach since last time, and gives just enough of a taste to bait listeners for more. Let’s see how things add up with a full-length release.